It’s been awhile but I’m ready to get back into it. I was traveling pretty extensively for thanksgiving and didn’t have that much time in front of my computer. I hope everyone had a great thanksgiving! Anyway, we already spoke about the history, design and implementing a lexer.. This post is going to focus on building the parser. Lexing, as we gathered a few weeks ago, is the lexical analysis part of the compiler. This is the process of deciding what each stream of characters mean. Are these characters some number? Are they a reserved keyword? Are the a variable name? The lexer will determine this. The next part of the compiler, is syntactic analysis. This is what the parser does, analyze the syntax of your language. This is different than analyzing the semantics of your language, however, and that is what we will talk about next time. In order to parse a language, you must first take into account grammar. Grammar is the set of rules that make up valid statements (often referred to as the alphabet) in a language. This is how a compiler knows that 1 + 1 is valid, while knowing 1 + + 1 is not. It is important to know that a grammar does not know the meaning of a string, only the form it may take. The job of determining the meaning of the string comes from semantic parsing, which we will cover next week. There are many different types of grammars, defined by noted linguist Noam Chomsky. 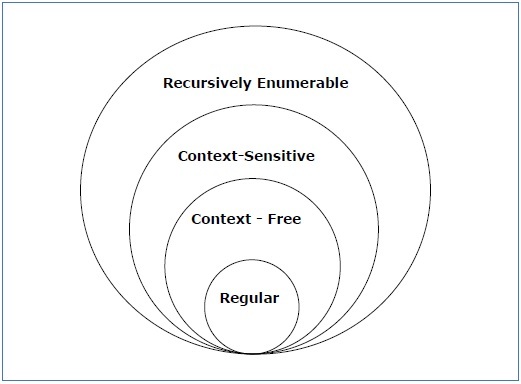 These include regular, context-free, context-sensitive, and recursively enumerable. We actually spoke a little bit about regular grammars. Regular grammars are what powers Regular Expressions! You may be wondering why we can’t use regular expression as our parser for building the entire programming language. The answer is not that simple. For simple languages a regular grammar may be good enough. But for more complex languages, regular grammars are hard to work with. This is because Regular grammars are either right-left or left-right (aka linear) whereas a grammar like context-free (which is what we will use to build Arbor’s parser) can basically be any combination of symbols. Context Free Grammars are the backbone of parsing a language. A Context Free Grammar is a set of production rules that describe all possible strings in a given language. These production rules are simple replacements and take the form B -> ß. This rule means that when you encounter a B replace it with a ß. This languages could take any string with all as first and all bs last. This takes abbbbbbbbbbbbbbbbbbbbbbbbbb as well as aaaaaaaaaaaaabbbbbbbbbb. When the parser encounters an a it replaces it with an A, so now a string like aaabbb becomes aaAbbb. Next it sees aA and replaces that with A so the string becomes aAbbb. This is performed one more time so that it becomes Abbb. Then, we do the same thing to the bs: Abbb -> AbbB -> AbB -> AB. Next we recognize that AB can be reduced to S and so AB becomes S. And S is our starting symbol and so we are done. So here we define NUMBER as any number, integer, or float. It is in all caps to show that it is not a grammar rule (non-terminal symbol), but a terminal symbol. A Non-Terminal Symbol is a symbol that can be reduced into a form that is a group of terminal symbols. Terminal symbols are the building blocks of the language. These are the lexemes you defined in the lexer. In other words, non-terminal symbols can be reduced to other symbols, either terminal or otherwise, while terminal symbols can not. In our grammar, NUMBER is the end of the road. We can’t reduce it to anything else. 1 is 1. It won’t become math. Now is this grammar valid? A simple test says yes: 1 + 2 * 3 - 8 + 66 / 3 * 4 is valid as well as 1 + 2. Let’s see why, using 1 + 2 * 3 - 8 + 66 / 3 * 4 as an example. If we run 1 + 2 * 3 - 8 + 66 / 3 * 4 through our lexer, the string becomes NUMBER + NUMBER * NUMBER - NUMBER + NUMBER / NUMBER * NUMBER. One of our rules says that math can become a NUMBER so there we go. The parser turns the string into math + math * math - math + math / math * math. Then the arithmetic rules come into play: we can reduce math + math to math, so math + math * math - math + math / math * math becomes math * math - math + math / math * math. We can do that for every rule in that string: math * math - math + math / math * math -> math - math + math / math * math -> math + math / math * math -> math / math * math -> math * math -> math. And we are done. That was a valid string. Of course none of this really helps because it looks like you are actually losing data, which is sort of true. But the tools that we will use actually makes it easy to maintain the structure of the program, which I will talk about next week when talking about the Abstract Syntax Tree. There are are few different types of CFG parsers; General Parsers, Top Down parser, and Bottom up Parsers. General parsers can parse any GFG, but they are incredibly inefficient for production use, so I will not say much more about them. Bottom Up Parsing, is what I did in the example above. It starts at the leaves (terminal symbol; NUMBER above) and moves towards the root. It is exactly what I did above: I started with NUMBER and reduced it to math and kept going until it hit S.
Top Down and Bottom Up parsers are what we use to build language parsers, they are not general parsers so you have to define a grammar for them and that is why we use tools like Bison or Yacc to generate these for us. Furthermore, we can actually break them down into different types of parsing: LL, LR, SLR and LALR. These are a bit complicated to explain here, but here is a link to the wikipedia page. If you are curious, the parser we are going to use is a LALR bottom up parsing. This is what powers YACC. Finally, we will get the meat and potatoes of describing a grammar in python for Arbor. Next I define a start symbol. Admittedly, I did this because I forgot what the default start symbol is in Ply. That is really as easy as just doing start = 's'. Now we can get started on our parser rules. Ply actually makes this incredibly easy. This is exactly equal to math -> math '+' math. Yacc will take all of the functions that are prefixed with p_ and generate your LALR tables for you. This makes the parsing so easy on you. Now to design your language, first you have to keep in mind the structure. I like to break down my rules are generally two types: statements and expressions. I define an expression as a statement that returns a value. So an expression is a type of statement. From there I define my expressions. Most things in arbors are actually expressions from this. I think the only things that are pure statements are my @module @use, and if/else constructs. Everything else is an expression. As we recall, I define s as my starting symbol. So s can be transformed into statements. Then statements is really just a combination of statements and statement. Finally statement is an expression with a SEMICOLON. SEMICOLON is a terminal symbol that I defined in me lexer that is, well, a semicolon. Or you can combine them in a single function, separated by a pipe (|). It really comes down to how you like to do things and your personal preferences. I often use both methods, depending on what I am trying to achieve. You may have noticed that you pass in a single parameter p into the parser functions. This p object is the parser object. Using this object you can access the values of the expression that the parser is currently on. You access this kind of like a list, where p is the value you want the left hand expression to have (the part before the colon). If you have this rule: expression : NAME, p refers to expression. After that, p to p[n] refers to everything after the colon in order. In this rule: expression : NAME PLUS NAME, p would refer to the first NAME, p refers to the PLUS and p refers to the second NAME. You would assign what you want expression to equal. For example, in the above rule, you may want expression to equal to the sum of the two values. That would be done like this: p = p + p. Notice you don’t return! Instead you just assign p to equal what you think it should return. If p is none, that means you hit the end of the file unexpectedly. When you are done defining your rules, you need to instantiate the parser. This is very similar to how the Lexer is instantiated: parser = yacc.yacc(debug = True). You don’t need debug=True although it definitely helps for debugging. After that, the parser object has a method called parse. You pass in the string you want to parse into this method and the parser will get to work. This method returns the value that was assigned to p in the entry node. For me this is where I do s : statements, but it could be wherever your start symbol is. That’s all there is really to parsing. Parsing is a major part of building a compiler, and the concepts employed in computer language parsing can be used anywhere! Lexing and Parsing really are the easy part of building a compiler. The fun parts come next: the AST and converting Arbor to LLVM bytecode. That is what I will talk about in the next post! By the way, I would like to point out that I am a few weeks ahead in building the compiler for Arbor. I am a bit sloppy with my code right now for the Arbor compiler and all of my stuff is in the parser branch (even though it should be broken down better). If you want to look at the latest and greatest, look at that branch!